or reddish tinge, with little difference between heartwood and sapwood. Alder does not evolve in color or darken when exposed to light or heat as other woods do, and takes stains and finishes well. More than some of the other woods, care must be taken to avoid damage due to its softer nature. Some small tight knots can be found with standard Alder. Cherry displays a distinctive grain pattern and warm color. The color ranges from nearly white to dark reddish brown. Dark pockets, pin knots, and random streaks are common. 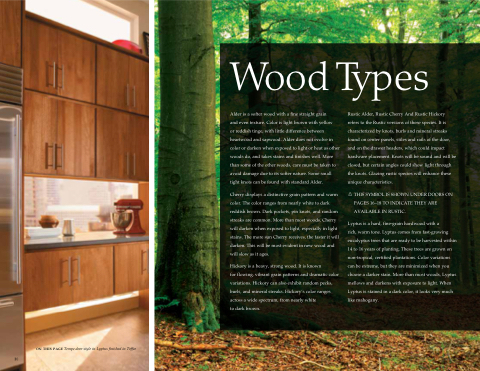 More than most woods, Cherry will darken when exposed to light, especially in light stains. The more sun Cherry receives, the faster it will darken. This will be most evident in new wood and will slow as it ages. Rustic Alder, Rustic Cherry And Rustic Hickory refers to the Rustic versions of these species. It is characterized by knots, burls and mineral streaks found on center panels, stiles and rails of the door, and on the drawer headers, which could impact hardware placement. Knots will be sound and will be closed, but certain angles could show light through the knots. Glazing rustic species will enhance these unique characteristics. THIS SYMBOL IS SHOWN UNDER DOORS ON PAGES 16–18 TO INDICATE THEY ARE AVAILABLE IN RUSTIC. rich, warm tone. Lyptus comes from fast-growing eucalyptus trees that are ready to be harvested within 14 to 16 years of planting. These trees are grown on non-tropical, certified plantations. Color variations can be extreme, but they are minimized when you choose a darker stain. More than most woods, Lyptus mellows and darkens with exposure to light. When Lyptus is stained in a dark color, it looks very much like mahogany.